Set up your own space by creating a group and customise it with your own logo, links and description. Your group will become your organising hub. Once fully set up, it can take out some of the admin that comes with managing a team of people. Plus, you’ll automatically get your own visitor-friendly page on our main site (like this one for Leicester Fixers). Need repair tools? If you’re a new group and need a hand stocking up with some tools, we can provide a starter bundle containing an iFixt Pro Tech Toolkit worth £60 for just the price of shipping. Click/tap here for more info. Coming soon: we’re working on providing you with a custom link you can use in your own emails to invite people to your group. Stay organised: you’ll have a list of everyone who’s involved, who you can contact through Talk (i.e. this forum). 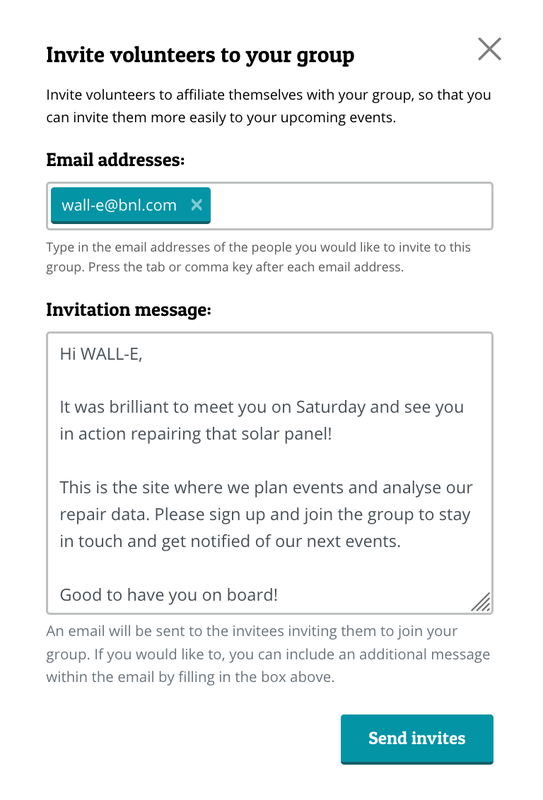 Keep volunteers up to date automatically: members of your group will receive email notifications whenever you add an event (if they haven’t opted out). See who’s coming to your next event: volunteers can RSVP to events you create, letting you know they’ll be there at the click of a button. Know what skills you’ll have in the room: if your volunteers have added skills to their profile, you’ll also see those, so you’ll know in advance what kinds of repair you can handle. No team yet? Share your plans with us in #community-repair and we can help. Restarters Talk (this forum) lets you send messages to your group members individually - as long as they’ve visited it at least once - without having to store their email address. So when it comes to GDPR, you’re covered! Learn how to use Talk here. Restarters Talk is also a great place to meet the rest of the network: ask fellow organisers for advice, share learning and connect with others passionate about community repair events. If you’d like a space for private group discussions, we can set up a private discussion space for you and your group, just like the ones here. This works a bit like a mailing list and gives you a place to co-ordinate while keeping a neat record of conversations. It also integrates fully with email, so your group members don’t have to log in to read or reply. Add events to your group to let the world know your plans - don’t forget to read our event-planning guide for help. Once approved, your event will automatically get published on the Restart website (like this one) and appear in our monthly newsletter to help spread the word. If your event is also on Facebook, we can shout about it there too. For a more personal touch and to confirm attendance, invite people via email straight from the event’s page. Remember that your group members will get notified automatically when you create an event. But an invitation sent a few days before the event can be a nice reminder to RSVP. Quantify how awesome you and your repairers are by adding repair data during or after your events. The tool will automatically measure your environmental impact, letting you and your volunteers know how much CO2 and e-waste you’ve diverted. As you run more events, your group page will keep a track of your total stats too. Coming soon: we’ll soon be adding support for non-electrical devices. See updates here. Saving waste and CO2 is definitely worth shouting about, so you can also share your stats with anyone, such as your community or funders. Coming soon: automatically generated, beautiful infographics you can share on social media! As you collect more data, you’ll be able to analyse the types of item you see at events (e.g. which devices are most common, have the highest fix rates and so on). There’s nothing quite like the satisfaction of fixing something that was broken — especially at a community repair event! But it can be equally frustrating when a repair proves too difficult or even impossible due to lack of decent documentation, unavailable spare parts or repair-unfriendly design. Restarters.net is our answer to this. It’s a place to share problems, solutions and skills with other repairers as well as record the repairs you make to help us campaign for more repairable products. But more than talking about specific devices, we’re interested in sharing transferable repair skills, which we document on our collaborative repair wiki. This is a great resource for anyone getting started with electronics repair as well as those with more experience. The Wiki is written and owned by the community and any member is welcome to contribute. It’s easy to keep up to date with repair events happening in your area. Simply find and join your local repair group(s) to receive a notification whenever they plan a new event (assuming you’ve opted into emails). Coming soon: we’re working on adding an ‘add to calender’ button for events, so you can download all the details to your favourite calendar software. To help out the organisers, you can also let them know you’re coming by clicking on the RSVP button on the event’s page. Knowing who plans to be there can remove a whole lot of stress for whoever is planning the event. Your local group has the option to use Talk (this forum) to send out messages. Is your group/area on the list? If so, make sure you join the discussion group to stay in the loop. You can choose whether or not to receive messages from Talk via email in your email preferences. Emailed messages are helpful if you don’t log in often, especially as you can reply to them directly from your email client. Learn more about adjusting your notifications or about how to use Talk. Every repair you make not only reduces waste and CO2 emissions, but can also help us learn more about why devices fail and what makes repairing them difficult. We can all probably list common issues with various products (like failing elements in a toaster and smashed screens on phones) as well as lots factors that make repair more complicated (such as the use of glue not screws, unavailabity of spare parts and so on). But wouldn’t it be useful to quantify these? For every event, we record as much data as we can about each repair. So far, we’ve logged well over 10,000 repair attempts together and are starting to use this data to help us campaign for our Right to Repair. It’s easy to record your repairs yourself, and by doing so, you might just be helping shape the products of the future!